Planning to install new fences on your property? Are you on the lookout for ways to install quality fences to keep you and your family safe from criminals and burglars? Hiring a professional fencing company can be the key to achieving high-quality fencing in Godalming. Wondering why you should leave fence installation to the experts? All you need to do is learn the many advantages of professional fence installation. Whether you wish to install fences in your residential or commercial property, hiring experts can be your most viable option. With their years of experience in installing and repairing fences of all kinds, specialists can help you achieve the appearance and security you desire for your property. Also right from planning and designing to the complete installation, experts offer a complete range of fencing services. 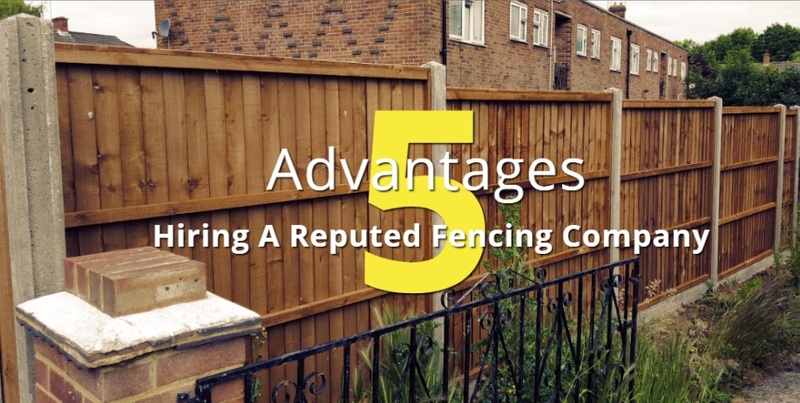 Here’re a few great advantages of choosing a renowned fencing company. Perhaps, this is the greatest advantage of seeking the services of a professional company. Fencing contractors have years of experience in installing different types of fences. Experts keep themselves updated with the newest fencing trends and latest service innovations to deliver quality results. You can always rely on skilled fencing contractors for quality installation work. Depending on the size of the project, fence installation can be a very time-consuming, labour intensive activity. By hiring a professional for installing new fences, you can save your time and spend it on other important tasks. In addition to time, you can even save money from purchasing expensive tools for the job. Since experienced contractors have the ideal equipment for all kinds of fencing work, you will be saved from buying pricey equipment. When it comes to fencing installation and repair projects, quality is very important. Hiring a renowned company will always be beneficial since they utilise the finest materials and professional tools for the job. No matter how small or big your project is, they will use high-quality materials to provide various metal options to cater to your project needs. Another great advantage of hiring a renowned company which specialises in fencing in Godalming is that all their work comes with complete guarantee. Other than providing high-quality tools and materials, they even provide guaranteed satisfaction to give you complete peace of mind. Hiring a professional fencing company can thus ensure you of your fences lasting throughout the years. Seeking professional fencing services can even increase your property’s value. By utilising proven products to maintain your fences, they ensure that the curb appeal of your property is maintained. The best contractors use high-quality materials to ensure that the fences stand the test of time so hiring a professional fencing company can thus help you increase the market value of your property. So what are you still waiting for? It’s time to approach a renowned fencing company and get new fences installed in your property!